Sarah Lillian Clayton was an 1896 graduate of the Philadelphia General Hospital (PGH) Training School of Nursing. 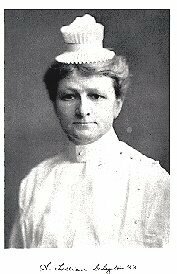 Her early work included night supervisor at PGH, private duty nursing, and special training to become a missionary nurse. After abandoning her dream of serving in China, she completed the Hospital Economics post graduate course at Teachers College, Columbia University and began a distinguished career in nursing education and supervision. She served in positions in Dayton OH, Minneapolis, MN, Chicago Il before returning to PGH. An innovative leader who championed the individual student, she created public support for nursing by forming a Women's Advisory Council and spearheaded the building of student housing, and developing post-graduate courses. She was a crusader for using staff nurses instead of students and allowing students a pre-clinical period in their education and expanding the traditional diploma school curriculum to include clinical experiences outside the hospital. She was also an advocate for student governance, a radical idea at the time! A national leader in nursing she served as president of National League for Nursing Education from 1917-20, was on the Board of Directors of the American Journal of Nursing, served on National Council of National Defense, Red Cross Nursing Service and the Pennsylvania Board of Nurse Examiners. She also served as chair of the American Nurses Association (ANA) Committee on Ethical Standards, which wrote a Code of Ethics for Nurses. Finally she was president of ANA for two terms although she died just before her term was completed. Miss Clayton is still honored today as nurses in the Philadelphia area hold an annual procession to the Woodland Cemetery where she is buried. 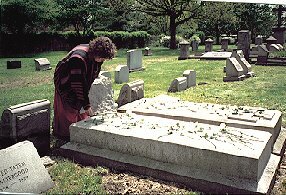 on the grave of Lillian Clayton and other nurses buried there. Egenes, K.J. (1998). An Experiment in Leadership: The Rise of Student Government at Philadelphia General Hospital Training School, 1920-1930. Nursing History Review 6: 71-84. Higgins, L. P. (1988). S. Lillian Clayton In: Dictionary of American nursing biography. M. Kaufman, (Ed.). Westport, CT: Greenwood. Murphy, S. (1992). Alice Fisher. In: American nursing: A biographical dictionary. Vol. II. V.L. Bullough, L. Sentz, & A.P. Stein, (Eds.). New York: Garland.